Temples. Lots – borderline too many of them. And sweat. I also managed to book what went down as our worst travel itinerary to date. The good news is I now feel like any travel within the US is a piece of cake. I still don’t know how I managed to talk Jake into 12 hours of overnight travel leading straight into a full day of touring old temples. Pretty sure I FaceTimed him at work just before a meeting and looked wildly unattractive enough to make our convo as brief and undetailed as possible. I would sell him on the sheer brilliance of the plan later. Angkor Wat would be worth it right? I mean, at the very least he could get that pose in one more time. Yea… So our schedule went a little something like this. Work a full day. Say goodbye to D and head to our airport at 6. Depart several hours later and fly to KL – which, I do NOW realize is in the opposite direction to Cambodia. Seemed logical at the time of booking. Endure a four hour flight where most people seemed to be flying for the first time. It’s a bad sign when the flight attendant’s explanation of how to buckle the seatbelt is actually necessary. Land at 1 am. Pray that there is an hourly hotel available to kill the time until the next leg taking off at 6 am. There is. Oh except… the airport is so freaking seedy that we’re not willing to explore what’s directly outside of it. ‘Don’t worry Jake – surely there’s a gate we can snooze at.’ No gates. One massive room filled with people sleeping on the floor. Most don’t even look like they’re actually traveling?! ‘McDonald’s!! !’ Sign outside McD’s: ‘We’re closed for our once a month maintenance from midnight until 6 am.’ It is now 2 am. We find a shop that sells $12 coffee that tastes like mud. We buy a cup for the wifi and nurse it for what seems like hours. 3:30 am. We are now starving. The locals are flocking to a fast food place called MarryBrown that appears to have fried chicken. That’ll do. No it won’t. The food is inedible. (And that says alot. I’ve been known to eat off the floor and once, out of a garbage can at the movies.) It’s okay, it’s now 4 am and we realize the check-in counters are now open. So have the 2300 other people in the room … and they don’t get the concept of a line…. or designated counters?? We are hoarded into another room, onto a bus, and finally onto the plane. An hour later we reached our final destination! And I must say – despite being VERY crabby, we perked up at the sight of the Cambodian airport (one of the prettiest we’ve been to), the exceedingly nice people, and our lovely hotel, which was a welcome sight. Unfortunately it would be another 12 hours before we could sink into our bed. Temple time! Banteay Srei: The standout temple of our first day, Banteay Srei is easily recognized by its red sandstone and consequently known as ‘the pink temple.’ The stone lends itself well to carving, so this temple was embellished with detailed carvings and sculptures, making it one of the most interesting stops of the trip. I’ll be honest – our first day started off a little rocky. We hired a driver but not a tour guide to accompany him. The poor driver tried to do us a favor and give us some history but…. we wish he hadn’t. There was a lot of muttering and zero understanding going on. After about five hours of trying to decipher what he was saying (there was one especially puzzling phrase that he said upwards of 100 times that sounded like, uuuurrrlllllnooooo), we realized it was best to just pretend we were asleep. Which, by midday, was not that much of a stretch. Actually – I will take out just a quick second from our riveting schedule to show some love for our hotel. Navatu Dreams is a small boutique hotel just outside of town. With fewer than 30 rooms, it was the quiet retreat we needed after our busy days and the personalized service was top notch. The rooms were spacious, grounds immaculate, and entire staff warm and welcoming as can be. The hotel is situated very close to Angkor Wat and just a little ways out of town so we were thrilled to find out that we had our own tuk tuk driver to accommodate us whenever we needed – whether it was touring the temples or taking us to town for dinner. Huge bonus! We also owe a quick note of thanks to The Luxe Nomad – the site through which we found and booked Navatu Dreams. The site has such good deals from goooorgeous hotels across Asia … and you know what? The staff that runs it really knocked my socks off 😉 I love personal service – and personable people. And the girls that run it are just that. They’ve promised me they’ll start expanding into the North American market soon! Our room was just steps away from one of the two pools and the restaurant, which served up all sorts of fare poolside. I was a huge fan of the salads – so unique and refreshing. THIS was the break we needed. Along with a little dinner, dessert and shopping in town. After a full night’s sleep, we were ready for Day Two, which wound up being FAR more enjoyable and much less a struggle than our first day. We opted to take up our hotel’s offer and have our tuk tuk driver guide the way. Young, funny and sweet as pie, he knew exactly which temples to take us to and how to get there in style. We spent a good hour at Angkor Wat – mostly piddling around taking pics like this. Our driver was surprised we didn’t spend more time, so if you intend on exploring every nook and cranny, you may want to allow a few hours. Afterwards we headed over to nearby Ankgor Thom, a walled Buddhist city built in the 12th century containing a number of temples. The ‘city’ is relatively small (here’s a map to help visualize it) so you can zip between sites quickly, but each is unique and memorable for its own reasons. Bayon: We were a little enamored with this temple. Did you catch the faces carved into the stone?! Baphoun: Another favorite, if only for the grand entrance and lush greenery surrounding it, and Phimeanakas: Temple of the Steep Steps. Sporting my new $1 bracelet at a temple whose name now escapes me. The next one, however, I can’t forget. Ta Prohm is where Tomb Raider was filmed. Smaller than I expected (although I’m one to talk – I’ve never seen the film), the temple was a maize of walls and little courtyards, with a few huge trees growing into the walls at the perimeter. So green! It POURED just as we were leaving Ta Prohm…. and it didn’t stop until the next day. Monsoon season at its finest! Angkor Thom – particularly three temples within called Bayon, Baphoun and Phimeanakas. Ta Prohm – where they filmed Tomb Raider. All of these are near to each other and can be done in a day, two if you really want to take your time exploring. We also loved Banteay Srei (the pink temple), but that is a bit further of a drive. Permits. 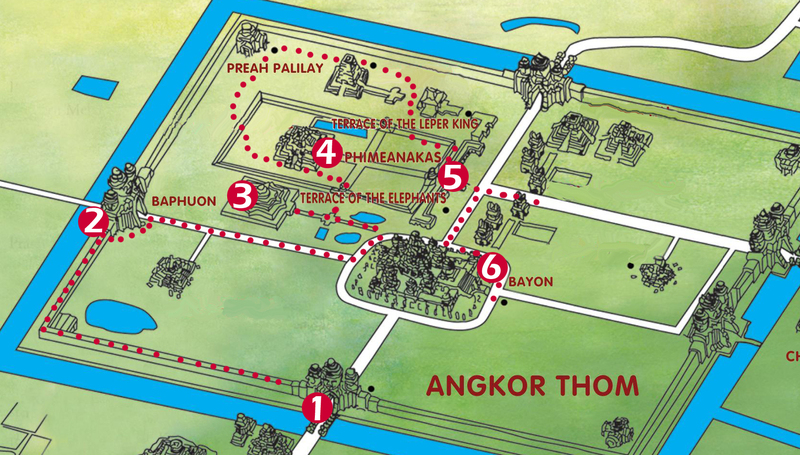 You will need an ‘Angkor Pass’ to visit the temples and sites in the Angkor park, but its a painless process. Passes can be purchased at the main entrance on the road to Angkor Wat. Tuk Tuks. This was our favorite way to get around. They’re efficient and so much more fun than a car… plus you get a nice breeze! Currency. We were so pleasantly surprised to see that Cambodia uses US dollars. After almost two years of using HK dollars and having to do the mental conversions, it was so nice to see a George Washington. Speaking of, have lots of single dollars on hand – the drivers, servers, hotel staff, and even the children near the temples – you’ll want to tip them all. Trust me! Indulging. Did I mention everything in Cambodia is really inexpensive?? Our meals were never more than $20 (with drinks!) and REALLY delish, so make time for all the food and drinks you can stomach! ← Chiang Mai, Thailand | Elephants – and Why I’ll Never Ride One!